The penultimate hurdle of the Premier League season safely skipped over last night. A predictable result for us. The two goal margin hardly reflected our control for long periods of the game and the siege of the Black Cats’ goal. Our performance was as easy on the eye as any home game this season, and a good deal more pleasant than some dour bus parking events. Fair play to Pickford, and all the Sunlun defence, who gave their best and were a good deal more competent than I have seen them in their other diabolical excuses for professional football this season. Another very good evening for Xhaka, from ‘zero’ to ‘Arsenal legend’ in just four games. His diagonal, long passing game is exquisite at times. Hector had another impressive match and it is very difficult to see quite where he and the Ox are going to fit onto down that side when both are fit. Both can play at right wing back and do it well. Where their combination leaves Theo I am not sure, sweating presumably? Ozil and Sanchez’s instinctive appreciation of each other’s position and intention sparkled, and Larry battled throughout. Very disappointing to see Aaron succumb to what looked like another muscular injury. Hopefully the Welshman’s withdrawal was precautionary as he is a man who is made for Wembley. So the dice are set to roll on at 3 p.m. on Sunday. Top Four or Thursday, Madrid or the Moldovan Post Office team ? We press onward with hope, as ever. Lol. Kroenke: “not about money”. Sorry to beak anybody’s bubble but business is always about money and power. That is what is most reassuring about Kroenke’s rejection of Usmanov’s bid which, by the way is derisive, as it represents the current current book value. No successful business sells at book value. Even an undergraduate student in finance should know that by rote. But back to my point. If Kroenke rejects £1.3 billion then it is clearest indication that he sees the value of Arsenal growing by substantially in the immediate future based on the current self-sustaining model. If Kroenke felt the business didn’t have a future he would sell up to the Uzbek in a New York minute. As with Chelsea and other foreign owned clubs, business people in England and America don’t give a hoot whether the buyer is an oligarch or not. Once you have the capital, they will sell up, take the money and run. when Kroenke became AFC majority shareholder six years ago Arsenal were valued at £731M, and now with Usmanov’s bid, its valued at £1.53 billion, so it has over doubled in value in just six years. In what world would it make sense for KSE to sell up for current market value. AFC has not won a league title in that time, nor reached latter stages of cl, and have won 2 FA Cups, with a possible 3rd next week. So the share value of the club has massive potential to increase a lot, especially if AFC can win league titles or cl in the next few years. When you look at it like that, it makes me wonder if Usmanov’s bid is anything other than a publicity stunt. Heather O’Reilly has leveled for Arsenal ladies in the 43rd minute. Arsenal have grown into this game and gone close a couple of times. won’t get to see the second half. ven de donk gave afc ladies the lead, brum made it 2-2 and then afc sub louise quinn scored two headed goals at set pieces, quinn the irish international defender signed after notts county folded on the eve of the season. must say former arsenal ladies keeper emma byrne was very anti arsenal in her comments during the game on bbc, it seems its not only our ex mens players who are down on the club. Departing Sead Kolasinac is suspended today. 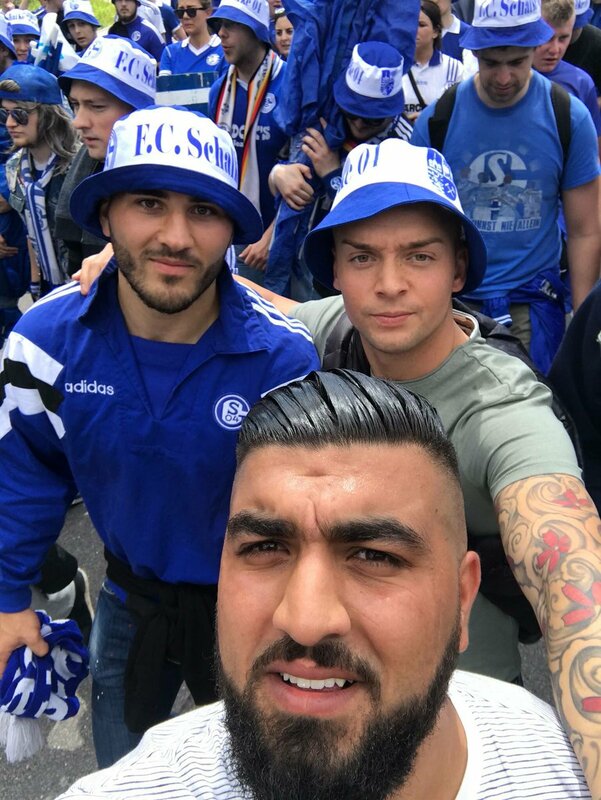 So he is spending the day with the Schalke fans for one last time. tomorrow is the last home game of the season and so will see the players and staff do a lap around the pitch. we have an fa cup final next weekend, and regardless of it being a top 3/4 or 5 finish we can expect the attention seekers to give our players and our manger some abuse as they do the lap. I really hope our true supporters turn on the banner wankers big time tomorrow. Eduardo, she is still bitter about being released by the club – she had some very harsh words to say about it at the time. passenal has any other club signed her up, or has arsenal’s decision to release her seem to be the correct one. she had 17 years at Arsenal, and won it all, its a pity she lets her release cloud that. After all she was only a back up player all last season. What do we need an Abramovich for? A few more players not injured and our rhythm was broken and we would have done better… that West Brom game where Alexis was battered comes to mind… small margins I think as the team continues to grow together. for example, we didn’t get enough of Xhaka and Elneny and Ramsey this season! I’ve given poor old Memz a terrible time on twitter. I was shouting”stay down, please stay down” in the end. Ancient Romarsenals protested because their circuses weren’t good enough compared to the good old days when there was war and actual soldiers used to be captured and used as gladiators. The old Gauls with their magic tricks, the old warriors of Brittania who would never refuse a fight, even if it were with a papyrus bag, and of course with the great general Davidus Deinus running the show, while some philosopher type took the credit. All this came to a head when some erstwhile gladiators became senators and claimed to be the vox populi, with their demands that a new chief be appointed to protect the empire from the enemy within. Irony hadn’t been created yet. Despite their heroic efforts , it appears their cause was lost because the Caesar they had chosen, though rich, was simply too fat and too slow to cross the Emirubicon, and decided to send his scouts towards Merseyblue instead. Still, they have not forgotten and pledge to continue their proud traditions to this day. Pity they never heard of the saying ‘History repeats itself’. Maybe because that’s what they do all the time as well. one thing I’ve seen over and over since the usmanov bid story has broken, is the refusal of the wob who want usmanov to take over afc, to explain how they can want usmanov in when usmanov has always stated wenger is the man for arsenal. I see many of them come up with many ways to skirt around the question/subject, things such as “usmanov would put pressure on him to win”, now they do not say “usmanov will give him the resources needed to win”, no that would destroy their view that wenger is not up to the task, so like a five year old refusing to admit they ate the cookie despite the crumbs being all over them, the wob try to deflect from the topic. look, i don’t know what usmanov would do if he gets control of AFC, he might sack wenger, even if new contract just signed, he might in fact give him a five year deal, he might pump in £300M a season in transfer funds till we win everything going, he might in fact keep afc as self sustaining. But I’ve seen nothing to suggest he will dump Wenger, I’ve seen nothing to suggest he will spend his own money on buying players. but kroenkeout, and wengerout are popular hashtags, as is the notion that usmanov offered to fund £100M worth of transfers a few years ago, but I’d rather have some evidence to go on, rather than hashtags or soundbites or notions. I am proud to be associated with a football club with such an enlightened view of ex-offenders. Tony Adams has opened up about his “nightmare” spell in charge of Granada and firmly blamed the players for relegation from the La Liga. The former England and Arsenal captain was appointed to his interim role on April 10 but has overseen seven consecutive defeats – matching the league record -to leave the club bottom of the Spanish top flight with just 20 points. Adams, now 50, had major heart surgery in 2015 while working at Azerbaijani club Gabala. “Working with this group of players isn’t easy,” he said. “But I’m thankful, I just want to say that personally, thankful that I’ve had the experience. I can’t say that I’ve enjoyed a lot of it, but I’m thankful that I’ve had the experience. Adams is a vice-president of DDMC – a company owned by Granada president John Jiang – and had been working with the club since November 2016 before his surprising appointment to take charge of the first team. Now the former Wycombe and Portsmouth boss will revert to his previous behind-the-scenes management position, looking to fortify the team for a promotion push. Adams, quoted on Granada’s website, blamed the players for the team’s relegation in a cutting assessment of their ability and the signings made by the club. “I think nothing was going to work with this group of players,” Adams said. “I think we’ve tried every formation, just like Lucas (Alcaraz, his predecessor) did. We’ve had three coaches, and we’ve had the same results, so you have to look at the players. Stan says Arsenal are not for sale, but Troopz said he is going to make him sell it Mmm. It’s even money between those 2 heavyweights.